Rethinking Faith and Church: Holy Flatulence? OK, I confess, I have a twisted sense of humour. I had to laugh when I saw this picture. The thought of two peasants dropping their pants and mooning the pope, while farting, is simply hilarious! However, as funny as I took the depiction, I’m sure that there are some others who are not as amused by it as I am. Perhaps my posting it even offends you. If so, I am truly sorry. Yes, while we may take it as a joke, others might not. We can say that they need to “lighten up” and take it as it was intended, but doing that also simply reinforces the point that I wish to make here. Whatever else it is or isn’t, the drawing serves as a powerful illustration of what I see as a problem for many of us in the church today. 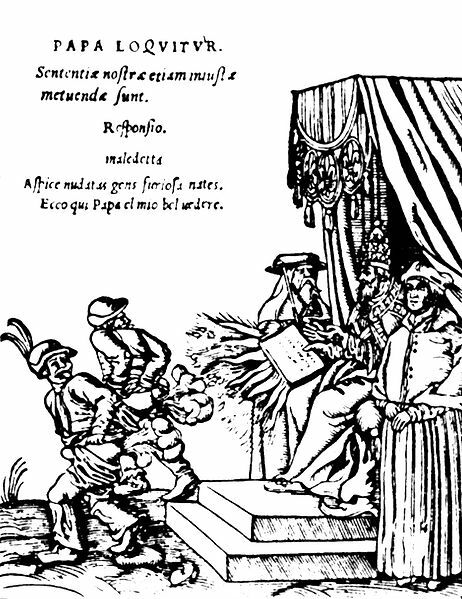 The drawing depicts an event from Martin Luther’s day around what came to be known as the “Protestant Reformation.” Reformation theology aside (for I am not interested in debating its pros and cons at this time) the picture also leads me to wonder how our actions and activities affect others. Regardless whether we call ourselves Roman Catholic, Protestant, Charismatic, or whatever other title we may choose to use to describe our particular slant of Christianity, if what we say or do offends another, have we acted in love? Perhaps we would do well to remind ourselves that, “For God so loved the world, that He gave His only Son” (John 3:16) for that other “twisted branch of Christianity too." I’m just saying, if He loved them too, shouldn’t we also? And if so, exactly what does that “love” entail? Let’s stop and honestly think about that for a moment. It has nothing to do with who is right and who is wrong, or who is theologically correct versus who is theologically incorrect, but it has everything to do with the question of following the “Golden Rule,” that is, of treating others as you would want to be treated by them yourself. Jesus put it this way: “And as you wish that others would do to you, do so to them” (Luke 6:31; ESV). Quite frankly, though others might still find it funny, you and I would likely be offended if we were mooned and farted upon! Do you see what I’m saying? The “Golden Rule” is not even an exclusively Judeo-Christian principle, for virtually all faiths have some form of it, as depicted by this poster which I’m sure we’ve all seen before. Ultimately it is about being a decent human being. This is not to be confused with doctrinal differences between faiths, for they are a completely different matter, the discussion of which we shall reserve for another time. The question is simply about our responsibility toward our fellow man. My question is, if other faiths see the importance of this, shouldn’t Christians (who claim to have the truth) see and practice it all the more? And if I am preaching to anyone here, I am primarily preaching to myself. Why is it that I sometimes still fail to treat others, including those who I love dearly, in a way that I would not want to be treated by them? That just doesn’t make any sense. Cain asked, “Am I my brother’s keeper?” (Genesis 4:9). Though deep down inside I’m sure we all know the answer to that, it’s kind of sad that many of us seem to still be asking that very same question ourselves today. “Am I my brother’s keeper?” Am I responsible to treat my bother properly? If so, doesn’t that include being careful to not go out of my way to offend him? That’s the way I see it anyway. Do You Have A Personal Church Story To Tell?